Is your cat among the smartest cat breeds? It's not too difficult to identify a smart cat. They usually have plenty of energy along with a mischievous streak. Most are highly in tune with the activities of their owners as well as other people and animals in the household. Intelligent cats need plenty of room to run and play, including vertical space. Environmental enrichment can help prevent boredom in all cats and is especially beneficial to intelligent cats. Without some kind of outlet, they may even develop behavior problems. Smart cats need to find a way to use their bodies and minds together. Training is another great way to engage your smart kitty. Along with being smart, the Abyssinian is one of the most popular cat breeds in the US. This sleek-looking cat is active and affectionate towards humans. They are very intelligent and highly tuned in to the activities of their humans. Abyssinians are not lap cats, but they thrive on human attention, especially in the form of petting or grooming. They also tend to enjoy the company of other animals. The Abyssinian cat was first seen as a breed when a unique cat was entered into the Crystal Palace Cat Show in 1871. This cat, named Zula, was said to have come from Abyssinia (Ethiopia today). The breed is also believed to have roots in ancient Egypt. 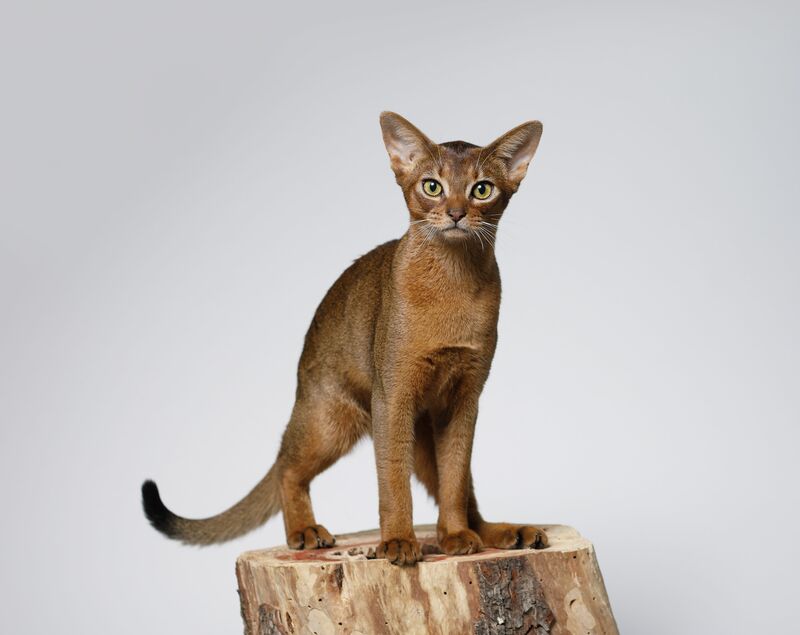 Abyssinian cats are athletic and agile, and they enjoy space to climb and play with toys. They love to learn and can respond quite well to training. There's a good chance you can train your Aby to perform tricks that both of you will truly enjoy! Best of all, they are intensely loyal to their humans. The Balinese cat is much like the Siamese except for the coat length. In fact, the Balinese is basically the long-haired version of the Siamese. The breed resulted from a genetic mutation for long hair in the Siamese breed. Rather than being named a Longhaired Siamese, the breed was named after the graceful Indonesian dancers of Bali. Balinese cats are known for their long, silky coats, svelte bodies, angular features, and beautiful color points. This is an active breed that loves to investigate the things its human is up to. Balinese are chatty cats that sometimes seem to act like they could learn to speak English. They are very loyal and affectionate towards their humans and want to be involved in all the household activities. Balinese can even get mischievous at times, but we honestly love them for it. The Bengal is perhaps best known for its exotic appearance and large size. This is the only cat breed that can have the spotted rosette coat pattern that resembles large wild cats like Jaguars and Leopards. This breed originated by crossing a domestic cat with an Asian Leopard Cat. Bengal cats are still a bit in touch with their wild heritage. They are bigger than most domestic cats, yet still extremely athletic and graceful. Bengals love to climb, run, jump, and play. Make sure you have adequate space for your cat to enjoy exercise; this includes plenty of vertical space. Bengals are extremely intelligent, a trait that can lead to mischievous behavior when boredom sets in. The Burmese cat is an energetic and friendly breed that loves to engage with its people. They are very interactive with humans but not overbearing. They are clever, adaptable, playful, and very trainable, especially when young. Burmese cats originated in Burma (now known as Myanmar) where it is believed that they were kept and bred by priests in the temples and palaces. One very unique feature of the Burmese cat is its deep-brown-to-copper coat. Though the breed comes in a few colors, the brownish hue is very recognizable. The Burmese is an average-sized cat that has a solid bone structure, making the cat feel a bit heavier than it appears. Its features are rounded and its coat is soft, making it easy to fall in love with the breed! The most unique feature of the Cornish Rex is its unique curly coat and its long, sleek build. The curls of the coat resemble the coat of a lamb while the body type is much like a tiny sighthound. This breed may look delicate, but the Cornish Rex is hardy and athletic. Cornish Rex cats are active and friendly. They are dog-like in their play, even into their senior years. Many even enjoy games like fetch! This is a great breed for someone who wants a cat that really loves being an interactive part of the family. The Cornish Rex breed was discovered in 1950s England when one curly-coated cat appeared in a litter or barn cats. As the cat grew, it was clear there was something that set it apart—a genetic mutation. Over the years, the breed has become loved by many for its unique appearance and personality. The Havana Brown is a beautiful cat with a silky, chocolate-colored coat, lovely green eyes, and exotic features. This is a relatively rare cat breed that is loved by many. Havana Brown cats are usually affectionate and chatty cats that love to interact with their families. They are moderately active and playful but also love to nap plenty of the time. The inquisitive Havana Brown enjoys using its paws to explore the world. The Havana Brown was developed in England by breeding Siamese with domestic black cats. The breed was brought to the US in the 1950s. Another rare cat breed, the Korat is a native cat of Thailand and is considered good luck in its native land. This breed is known for its heart-shaped face, silvery coat, peridot-colored eyes, and compact bodies. The breed also has a heart-shaped appearance to its nose and chest. Korats are relatively playful much of the time and love to nap the rest of the time. They are very smart and attentive to the world around them. Korats bond closely with their humans and like to be around them as much as possible. They enjoy interactive play with their humans as well as cuddling with them during naps. The Savannah cat is yet another rare and exotic cat with high intelligence. Developed by crossing African Servals with domestic cats, this breed kept its wild side. It is larger and taller than the average domestic cat and has an exotic appearance thanks to its large pointed ears, long, lean body, and spotted coat. The Savannah is a relatively new cat breed that is growing in popularity. However, this breed is not for everyone. Savannah cats need plenty of open space and vertical space to run, jump, and play. They are very intelligent, adventurous, and bold. This breed tends to get bored easily. They do best with plenty of human interaction and environmental enrichment. One of the world's most popular and recognizable cat breeds, the Siamese is known for its exotic appearance, beautiful color points, and tendency to be chatty. Siamese cats are smart, affectionate, playful, loyal, and quite vocal. Siamese cats originated in Siam (now Thailand) and have been represented all over pop culture, including a handful of animated films. This beloved breed loves to play and exercise but also enjoys curling up in the laps of its favorite humans. The Singapura, as its name implies, originated in the streets of Singapore. In fact, Singapura is the Malaysian word for Singapore. The breed was brought to the US in the 1970s and is still considered rare. The Singapura is a playful, outgoing, and curious cat that loves to be involved with anything its human is doing. The breed is a bit smaller than the average domestic cat and has a unique coat of rich brown with a ticked coat pattern. These cats love to get active and climb, so make sure you provide plenty of vertical space.